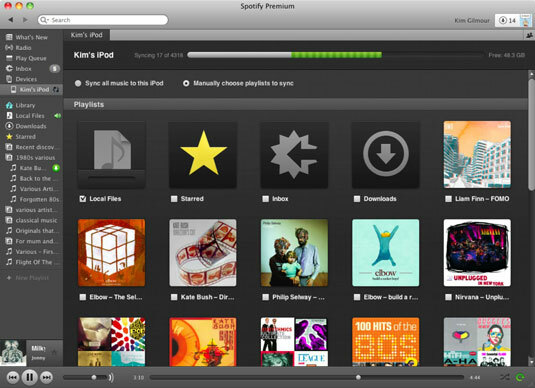 You can manually choose Spotify playlists to sync to your iPod, rather than let everything sync automatically. The grid of images across the page represent folders of your music, including playlists. Your folder of local files (represented by the music-note icon) is listed first; selecting this icon syncs all your local files to your iPod. You also see folders for your starred files, Inbox tracks, and existing downloads. Following these folders are all your other playlists, represented by a collage of album cover art (if a playlist consists of just one album, then only that album’s cover art is displayed). When you select the manual sync option, you select the check box next to the playlists that you want to sync. If you have a high-capacity iPod, you probably want to sync your Local Files folder because it contains all the music stored on your computer. Because of its size, it takes the longest time to sync, so be patient! It may take a few hours if you have tens of thousands of tracks, but it doesn’t take that long the next time because it knows to sync only new tracks. If you’re using an iPod shuffle or nano, your Local Files folder probably can’t fit onto your device. Create a selection of playlists based on the tracks you own and manually copy these playlists over to Spotify, instead.